Sizes: Euro 40 (US 0)-50 (US 12). I'm wearing a 44 jacket and 42 pants but normally fit into a 40 in other Alpinestars jackets. The Vika was really designed as a fashion leather outfit, with modest protection as a compromise to create something that was lighter and more comfortable for city riding. I was really looking forward to seeing and trying this outfit in person, with hopes that it would have a similar function/fit as the Tyla. Unfortunately, it wasn't exactly what I was expecting. The Vika is a really lightweight jacket that works as a substitute for your casual leather jacket, with the exception that the fit is more motorcycle friendly and has armor pockets in the shoulders/elbows and back. Aside from those features, there's not much that differentiates this jacket from something you'd buy that looks like a motorcycle jacket from a department store. The armor pockets are really the main difference. It's minimally featured with 2 outer pockets in front and 3 inner stash pockets (2 on the left, one on the right). The leather is thin so it's really chilly below 65 degrees. I'm always cold, so this only works for me at 75-80 degrees. I couldn't wear this in fall or winter for San Francisco riding. This jacket runs small, so order up one size than you normally would. It's really really tight at first, and definitely stretches out. I asked for 2 sizes up in the jacket and should've only asked for one (42). It's so hard to tell how much something will stretch and I was a little paranoid about the armpit fit in riding position. It was pulling quite a bit. But after breaking it in, I've realized that a 42 would've been fine. For me, my shoulders are broader as well. But as you can see, even wearing this 2 sizes up it doesn't look super big. And is still snug enough to wear just a tshirt or long sleeve underneath. I took this picture when it was balmy and 70 degrees out so I didn't need to layer that day. Generally speaking, the jacket is ideal for a longer torso. There's not a lot of bust space, but average. The arms are standard. They're a touch short on my SV since I have full reach but are perfect riding fully upright with Betty. I also rode my friends DR650 that day and it was comfortable then too. Also if you run cold, you'll only be warm in this one during the summer. Otherwise, a heated jacket liner might help, although since it doesn't have much in terms of wind protection, that may not help very much either. If you're looking for a lightweight option for city riding then you'll probably like how this fits and feel since it does have a really casual look to it. But if you need a warmer leather jacket, with more protection and the ability to ride at least 3 out of 4 seasons, this isn't it. Overall, I can only recommend this jacket if you're looking for something lighter for summer and have extra $ to spend. It's a lot of money for a minimally featured jacket, for those of us who ride often and need something to perform. For this price point, I highly recommend looking at alternatives from REV'IT and Dainese instead. You mention that there is not that much difference to this and a department store jacket, I would disagree with you we use only premium hides that have to go through numerous test for abrasion resistance, seam strength and also that the pigments will last within the material and not weaken the structural integrity of the leather, how many department stores do that. When you use the best leather then you get that very soft feel, but that should not be mistaken for the thinner leathers that some of the department stores use. 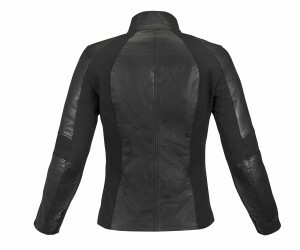 The jacket uses a 1mm thick leather that is treated to offer the ultimate softness and comfort. The VIKA is part of our city collection and aimed at the casual rider who is not racing around or doing track days that will probably be riding in a more upright postion. The VIKA also has the armor that will harden on impact to the same level protection as you get out of some the heavier and denser foam varieties, they were developed specifically for the VIKA as they are lightweight and low volume. In a department store jacket you won’t get any protection. I guess the way I sum this jacket up is that it's more of a fashion statement, with modest protection (aside from armor). Since the material isn't designed to hold up to highway speed slides/abrasion, you should only consider wearing either piece around town or short commutes. I would never wear this outfit touring, traveling or on the highway. It's certainly enough protection for city speeds (~15-30mph) but not much more than that.